Web-based learning is limitless—unless you can’t get online. There are many advantages to working online, including access to online content and centralized user management and reporting. The benefits are limitless—unless you can’t get online. A digital gap has emerged for students who live in remote areas where Internet connections are either spotty or simply not available at home. Initiatives to bring connectivity to these areas are already underway, but it will take time. A homework gap has emerged for students who don’t have access to the Internet at home. Schools are getting creative, offering Wi-Fi access on buses. Students are swarming to local libraries, laundromats, fast food restaurants, even street corners—anywhere they can find free Wi-Fi access. Companies are offering free internet…but some students are still left without. How can we prepare students for college where 85% of all learning comes from independent reading (Nist & Simpson, 2000) While we cannot solve the digital gap or homework gap, a new feature in k3000 can help: Offline Mode. The new Offline Mode for Mac and Windows provides schools—and students—with even more flexibility. You can gain all of the benefits from a Web Access subscription, while providing literacy support when internet connections are spotty or simply not available. Offline mode also has great applications for providing test-taking accommodations on disconnected computers. Tests that call for more than locking internet connection in Kurzweil 3000 can use Offline Mode. Log in when the computers are connected, then disconnect the internet. Additional feature and document locks will ensure students only have access to approved accommodations. If the internet goes down, or is spotty, learners can continue to work offline without skipping a beat. When the connection is lost, users will be prompted to work offline. They can then save their work to the computer, uploading it to the online library once connectivity is restored. Logging into Kurzweil 3000 will allow access to literacy supports for up to 432 hours offline. Students who are traveling, or on break for the holidays, can get the supports they need while they’re away. Log in to Kurzweil 3000 when the computer is connected to the internet. 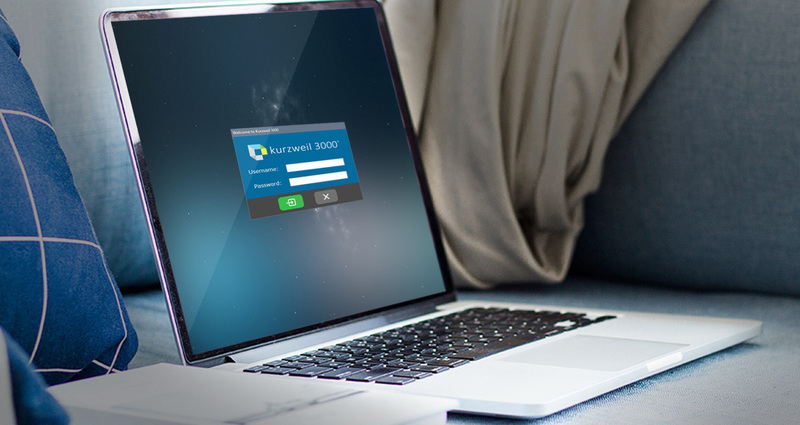 The Kurzweil 3000 credentials are saved in a secure location on the computer. When internet connectivity is either low or gone, users will be prompted to work in Offline Mode. Any work saved to the computer can then be uploaded to the Kurzweil 3000 online library when the internet connection is restored. Note that web-based features, such as online reference and translation will be grayed out until the computer is re-connected to the internet.